When selecting an aluminum fence for any residential or commercial property, your choice of style is important. It should enhance the appearance of the property while providing the desired security and visual effect. 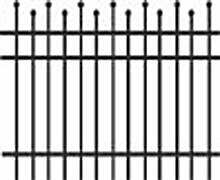 As the leading national discount fence supply company, we have chosen Jerith aluminum fencing products to supply our customers. Along with Jerith’s legendary quality and manufacturing excellence, the manufacturer offers a wide range of style and grades. This lets you match an economical, durable and low-maintenance design with your exact needs. With alternating heights of individual exposed picket spindle tops and a classic Mediterranean design, the 100 style is one of their most popular designs. Available in both Residential grade at very affordable pricing and in heavy-duty Industrial grade, this style is suitable for all applications. Choose from four classic colors and heights ranging from 3 to 8 feet. Matching gates, including industrial grade swinging and sliding gates, are available, as well. Every Style 100 fence is designed for affordability, performance and long, maintenance-free life. All of the excellent features of Style 100 fences are available in Style 101, but with all pickets at the same height. Both Residential and Industrial grades, in four colors, are highly affordable, and present a clean, simple appearance that is an ideal match for many properties. In the Industrial grade, gates up to 20′ wide are compatible with electric gate operators, as with Style 100. Beautiful arched gates are another choice, as are decorative spindle top accessories. Residential grade Style 101 fencing starts at just $13 per linear foot, and black panels are available for immediate shipment. 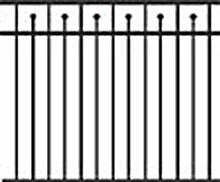 If you prefer an aluminum ornamental fence with a top rail, this style is an excellent choice, and features alternating exposed picket tops under the rail. Residential and Aero grades in this style are available in heights from 4-6 feet, and the Industrial grade, called Laurel, comes in heights from 4-8 feet. As with all Jerith fencing, each panel comes completely assembled and ready for installation. Panels can be easily raked for installation on sloped terrain, as well. Matching level and arched gates are available in all heights. This elegant design offers strength and beauty at an affordable cost. This style has the same appearance as the Style 200 design, with a top rail and alternating exposed picket tops. It also includes a bottom rail that covers all pickets, and is specifically suited for swimming pool enclosures and other installations where safety requires enclosed picket bottoms. This style meets ICC pool safety codes, and is available only in 54″ high panels in the Residential and Aero grades. For enclosing pools, play areas, and other areas where bare feet need protection, it’s a perfect choice that blends well with Style 200 fencing on other parts of the property. If a clean appearance and completely enclosed picket tops is your choice, the 202 Style is ideal. It fits in beautifully with all building styles, and is available in Residential, Aero and Industrial grades. All four colors are available, and heights range from 3-6 feet, with 8′ heights available in Industrial grade. 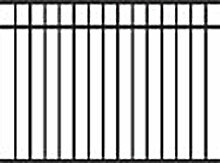 A complete range of matching gates, either level top or arched, give you unmatched control of your perimeter enclosure. Fast installation, unmatched strength and durability, along with fast manufacturer-direct shipment make this product a popular, affordable choice. For pool, play and pet enclosures, Jerith’s Style 202 fencing matches the design of Style 202, but with fully enclosed picket bottoms. It comes in 54″ high panels only, and meets ICC pool fence safety codes. 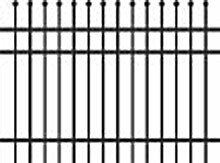 Choose from Residential and Aero grades, in Black, White, Hunter Green and Bronze colors as with all Jerith fencing products. Mounting options allow these modified style panels to be installed on all surfaces. If you’re using Style 202 fencing for other property perimeters, the 202 Modified style is the ideal choice for enclosing specialized areas. Where close-set pickets are a priority for your fence design, the Style 401 is an excellent choice. 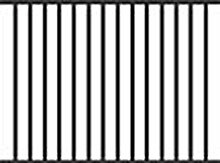 Pickets spaced just 1 7/8″ apart provide the look of strength and security and protect children and pets exceptionally well. Picket tops in this style are exposed and all of the same height. Available only in Residential grade, in heights from 4-6 feet, you can choose from all four Jerith colors. Add gates with either level or arched tops from 3-6′ widths to complete your project. 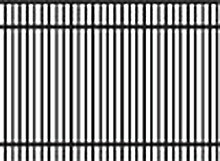 This style is ideal for property perimeter enclosures, where its secure strength deters trespassers. 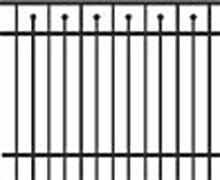 As with the Style 401 design, this fence features closely spaced pickets, positioned just 1 7/8″ apart. Offering a secure appearance of strength, it’s a popular choice for perimeter fencing around residential properties. 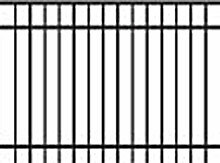 The top rail completely encloses picket tops for a clean look and additional strength. In Residential grade only, panels come in 4′, 5′ and 6′ heights, with matching gates from 3-6′ wide. Choose from all four Jerith colors and enjoy fast installation and enduring appearance for your property. Both Style 401 and 402 are great choices for both residential and some commercial properties. Jerith introduced its Ovation style fence to meet the needs of property owners who wanted simplicity, economy and strength in a quickly installed aluminum ornamental fence. With only top and bottom rails that completely enclose the pickets, this design is available in only 48″ high panels, in the Aero grade. All four colors are available, with white and black having “Quick Ship” status to ensure fast delivery. Swimming pool enclosures, pet and play areas, and other specialized needs are ideal for an Ovation fence from Jerith. Matching gates are available, of course, from 3-6′ wide. 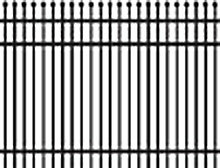 Ovation is one of the most popular ornamental fence styles available today. If a durable, affordable, low-maintenance aluminum ornamental fence is in your plans, don’t settle for the limited selection and unknown quality of materials from local suppliers. Call our trusted discount fence supply company for a money-saving price quote on your choice of outstanding Jerith fencing styles. We’ll help you create a complete materials list from your dimensioned sketch and arrange for fast shipping, direct from the manufacturer. We pass along our high-volume purchasing discounts to help you save on the cost of your project, and offer expert assistance to help you choose the ideal products for your needs.